I’m not sure how many times I’ve heard it over the past 2 weeks . . “The Santa Clause Rally”. And the whole story about December being a “seasonally strong period”. OK, so the statistics show that over the past x years, but that data would only make (some) sense if every year had the same market conditions in the immediate past; and they don’t. Bah Humbug on “The Santa Clause Rally”. I’ll stick to my charts. Right now I see that this market blew through the secondary support level at 4724 and headed straight down to the major Support level at 4650. It needs to stop there. On Friday the market gapped down at the open, then slowly recovered to near breakeven, only to see major selling in the last half hour. looks like nobody wanted to hold positions over the weekend. Money Flow continues to go down (selling) and Market Sentiment is now firmly Bearish. What to do? I closed my market index positions and moved them into Cash. As support levels (i.e. stops) are hit I’ll move them into Cash; a couple did that today. I’m seeing strength in “short” instruments for Emerging Markets and Latin America, but be careful as these “turn on a dime” . . . small positions only. Let’s see how the general market is holding up via the components of the S&P 1500 Index. 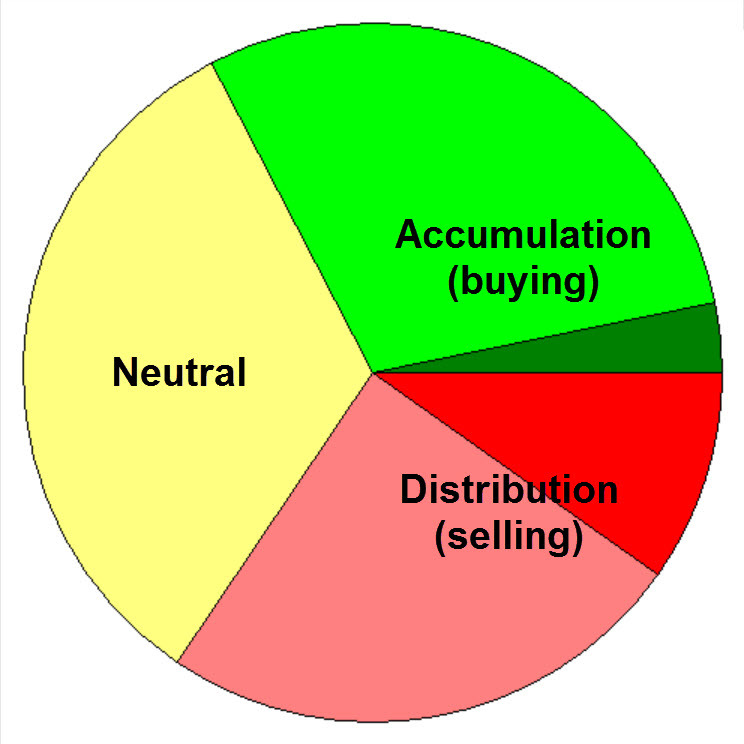 This pie chart takes a few days to make significant changes, but we do see a deteriation in the green area and more in the red (refer to previous posts). Since volume was about average on Friday I don’t see panic yet, so before taking any major action I’d wait and see what happens on Monday. Is there intuitional follow through after the first hour the market is open? A significant break below 4650 and I’ll start to put on a hedge to cover remaining (long) positions in the portfolio. Santa may come late this year . . . or not at all.